Tasmania is an island bursting full of strange and wonderful wildlife, unlike anywhere else on Earth. 150 miles south of mainland Australia, it’s the last stop before the frozen wastelands of Antarctica. However, with snowy mountains, temperate rainforests, pristine sandy beaches and glacial lakes, Tasmania truly is as unique and awe-inspiring as its giant neighbours. Tasmanians have always seen themselves as distinctive. Australian yes, but with a twist. The same is true of its wildlife. The bizarre platypus, the echidna (or spiny anteater) and the carnivorous Tasmanian devil are just a few creatures that call Tasmania home. If Tasmania is internationally famous for one creature alone, then it is the Tasmanian devil. The biggest carnivorous marsupial in the world, it is well known for its powerful jaws and bloodcurdling call. The devils are the hyenas of Tasmania; killers and scavengers with a bite as powerful as a dog four times its size. 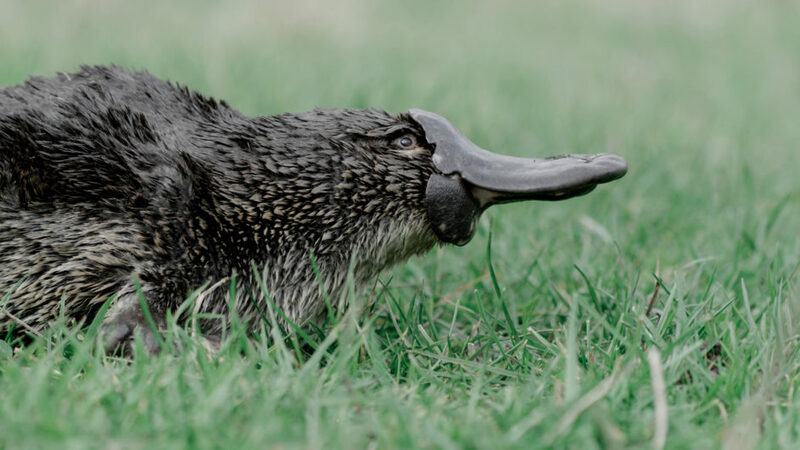 The platypus once baffled science with its strange concoction of body parts. This mysterious, secretive animal is difficult to see in the wild. However, one man has managed to nurture a close relationship with a wild platypus, allowing intimate details of its daily to be filmed. It’s hard to pick the quirkiest of Tasmania’s animal; but the echidna, a relative of the platypus, must surely be a contender. Covered with spines like a porcupine, it definitely doesn’t have a sweet tooth: completely toothless, the echidna uses its extremely long tongue to feed on ants and other insects. Then there is the wombat. A giant burrowing ball of fur living life in the slow lane. Even its digestion is slow, sometimes taking more than week to process a meal. Where the wombat lives, winter means sub-zero temperatures and heavy snow. So how does a new-born wombat survive? There is one animal you wouldn’t necessarily expect to see in Tasmania, the penguin. However Tasmania is home to the smallest penguin in the world, aptly called the fairy penguin. Its presence along Tasmania’s shoreline is a result of the island’s unique position close to the bountiful waters that surround Antarctica. Moving between these key stories as the seasons progress, we’ll showcase the landscapes that make this island so special. We’ll also meet a whole cast of other creatures – including white wallabies, eastern quolls, jumping ants and glowing worms. ’Tasmania: Weird and Wonderful’ will be a visual feast filled with intimate stories and amazing discoveries from one of the few places on the planet that can still be considered truly primeval.